I dont know if maybe I am getting a little smarter having “been raised” by 4 flatcoats here at Pemberly or if Reagan is just an exceptional little girl. I would guess its the latter. Miss Reagan’s field work had really started to come together last summer. We had spent a miserably cold winter working on our force fetch and collar conditioning as we were starting to see a tendency to drop items or not return as promptly on her retrieves. Many positive trainers cringe at the mention of an electronic collar or as they call it, a “shock collar”. However, this tool can be very effective in the right hands and is to be only used to enforce behaviors a dog already UNDERSTANDS! It is not designed to TEACH and should be used only by or with the assistance of a professional. Choose your pro carefully and ask to watch them work the dogs in their care. You want to see dogs HAPPY doing their jobs not ones with ears back, tails down or not even wanting to come off the truck! The reason a “trained” retrieve is necessary for a working dog is to assure that your dog will return with all birds even wounded,wet ducks. It is important to seek a professional if you choose this method although several videos by Mike Lardy, Jim Dobbs and Evan Graham demonstrate this exercise well. Many obedience trainers use a positive form of this exercise as an alternative . One reference is “Positively Fetching.”The key to this exercise is to teach the basics of holding an item whether it is a bumper, dumbbell, newspaper or bird. Then teaching the fetch or take it command and reinforcing your commands. Reagan worked well thorough the fetching exercises and her drive and reliability improved. We decided to enter her in an AKC Junior Test. It was a 1 day test and Keaton was entered in Master so I thought it would be a good day to see “where she is at”. At some point in your training, you just need to dive in and see how well your dog handled his/her new skills in a testing situation. Sometimes, it turns into an expensive training day but I have always found a lesson learned even if no ribbion comes home with us. Junior dogs are required to retrieve 2 ducks on land and 2 ducks on water as single retrieves. Although many junior dogs have been started on blind work and handling, it is not a required part of a junior test. This test is designed to test a young or inexperienced dog’s marking ability, trainability, style, and perseverance as a hunting dog. If your dog does handle and is having trouble, you can handle to 1 mark only. Many junior dogs fail due to lack of experience by not coming up with the bird . Other dogs are not yet force fetched and will not return with a bird or drop the bird and not pick it back up. The dogs do not have to be steady so the handler may hold onto the collar or a lead slipped thru the collar. After running master, junior seemed so straight forward and less pressure on me since Reagan did not handle. She either found the bird on her own or not and that was it! Our first series was the land series with a number of large goose decoys which the dogs would need to run past to get to the bird. Reagan had seen decoys before, but she did glance at them as she ran thru them which took her eyes off the mark resulting in her putting up a hunt for the bird. Her second bird was down a hill and it is hard for dogs to drive straight down a hill and not fade . Although she faded with the hill, she found it quickly. The water marks were in a pond with patches of lily pads and decoys on the edge of the water. Reagan was not deterred by the lily pads on her marks and even took the angle entry mark well. She had her first junior leg. With each test, her confidence and marking improved. Her manners in the holding blinds was quiet and steady;however her love of the game made it a bit of a challenge to come down to the line . She wanted to forge ahead . As I have found with both her grandmother and dad, reinforce manners early! Later that summer, she was entered in her first UKC started test. In started, the dogs do not have to deliver to hand and the marks are generally shorter than in AKC junior. It also requires 4 legs to get the title, Started Hunting Retriever or SHR. Unlike Junior, the birds are never live flyers and the gunner shoots primers from the line. Reagan was a rock star and earned her first two legs at the BackWater Retriever Club in June of 2011. 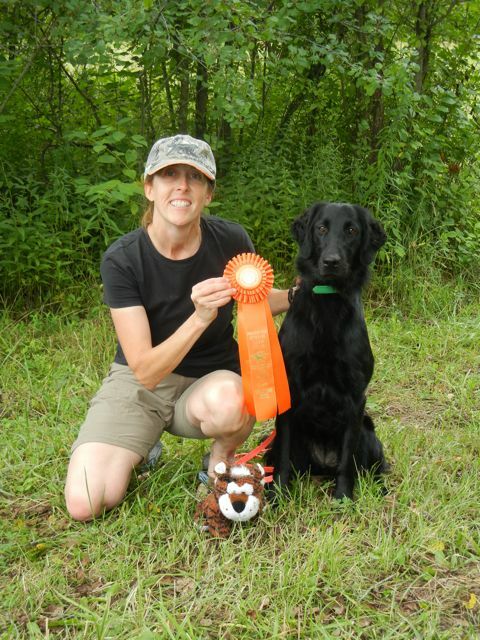 She finished her AKC junior in september at Backwaters fall test doing nice solid work. Her UKC title was finished in April of 2012 in Kalamazoo Michigan. She was 8 for 8 for both titles. To add to her accomplishments, she ran and passed the White River Golden Retriever Working Certificate in October 2011. This is similar to a “mini-field trial” that was developed prior to the introduction of hunt tests to test working talent of dogs whose owners did not wish to pursue the competitive sport of field trials but wanted to demonstrate field ability in their breeding stock. It is known as the WC and WCX(working certificate excellent) and requires only 1 pass to achieve the title. The gunners are wearing white coats and are in full view of the dog/handler. The golden club require upland birds on land(pigeons, chukkars or pheasants are the most commonly used). Pigeons, “rats with wings” , are frequently used due to availability and price. Flatcoats can use ducks, which are much more pleasant for the dogs than pigeons but there is NOTHING more exciting than a Rooster Pheasant flyer to most retrievers. The WC includes a “double”(2 birds thrown sequentially at 90degrees from each other) on land and 2 singles(30-40 yards) in the water. The dog does not have to deliver to hand, just within a few feet of the handler. I never enter my dogs before they are through force fetch and delivering to hand. I dont want to start a bad habit of dropping birds at tests, but many handlers standards are different. Reagan had never done a double prior to september so we had a month to prepare. She did not need to be steady for the “C” , but it does require the dog to count to two. Since the two marks are short, the dogs have “less time to forget” where the second bird fell IF they do not have a long hunt on the first bird. The dogs must also not “switch”. Switching is defined as the dog hunting the area of the fall of one bird, leaving the area and hunting the second fall area. If the dog runs out to the area, but does NOT hunt and swings over to the other fall, many judges will not call it a switch and can pass the dog. Again, some handlers will allow this but since I am looking for a dog who will run master in the future, I would rather my dog fail the test then give up a hunt and look elsewhere. Thus, I would either whistle sit my dog and handle to first area or call dog in. Reagan pulled off the WC although I could tell her memory was a little “shakey”. All in all I am proud of her accomplishments with our limited time to train. I look forward to this journey. She is truly a dual purpose dog, pretty and smart. She is a joy to train and fun to cuddle. This entry was posted in The Reagan Diaries. Bookmark the permalink. What a stellar season you are having! Thanks! I have found the training part has really strengthened the bonds I have with my dogs. The trials are just a time to spend with my canine pal and other handlers who love the dogs and sport as well as I do.